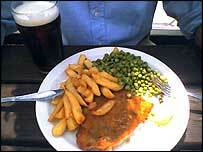 BBC NEWS | UK | Magazine | The perfect diet? It's summer time, and thoughts turn to how to get into those swimming costumes in time for the holidays. 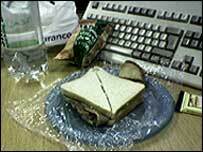 The GI diet has toppled Atkins as the regimen of the moment - but can you still eat sandwiches for lunch? Fruit is good. So too are salads, dark chocolate and grainy bread. Crisps are bad. Ditto beer, pasties and white baps. These are the diktats of the GI - or Glycaemic Index - diet, which revolves around choosing low carbohydrate foods and lean meats. It was first touted quarter of a century ago as a way for diabetics to control their insulin levels, and has been popular in Australia for almost a decade. In the UK, the GI diet hit the headlines briefly a few years back when long-time adherent Kylie's gold-hot pants became something of a tabloid obsession. But then we were a nation in thrall to the Atkins regime; not even the diet credited with sculpting Kylie's curves could tempt slimmers away from their steak sans frites. How healthy do you think it is? Now in hype terms, Atkins has had the wind knocked from its sails, and the GI diet has stepped up to take its place. Books detailing low-GI recipes are storming the bestseller lists. Food ads and labels boast (sometimes spurious) GI claims. 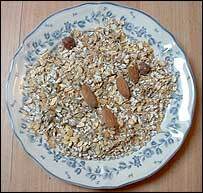 Porridge is on the breakfast menu in City take-out joints. And diet gurus and health professionals appear to be singing from the same hymn sheet in praise of GI. And then there are its star followers, ranging from the slim and beautiful (Kylie, Jodie Kidd, Kim Cattrall) to the health conscious (Steve Redgrave, the Clintons, Antony Worrall Thompson). So how does it work? The Glycaemic Index ranks carbohydrate foods from zero to 100 on the rate at which they raise blood glucose levels. Low GI foods break down slowly and so raise blood sugar at a steady rate that sustains energy and helps you feel full for longer. High GI foods flood the body with sugar fast, but the effect wears off just as quickly. But these can have their place, for instance a banana or a glucose drink after strenuous exercise to replace blood sugar used during exertion. The key to it all is insulin - low GI diets reduce insulin levels. For not only does this hormone stimulate fat production, it inhibits the breakdown of that fat. Too much insulin increases the risk of obesity, diabetes and high blood pressure - all health time bombs in industrialised countries. "In theory the GI diet is quite easy - you eat low GI foods," says registered dietician Helen Stracey, of the British Dietetic Association. "But it can be complicated when you try to work out the GI value of a meal." The diet allows three meals and three snacks every day - but the points for each food should be added up in order to stay within the daily limit, necessitating a meal plan. And healthy foods with a high GI rating, such as baked potatoes, can be offset with a topping of low GI baked beans. Nor should foods be chosen on their GI rating alone; instead look at their overall nutritional value. The World Health Organization, which has given the thumbs-up to low-GI eating, agrees with this approach. Ice cream, for instance, has a lower GI rating than watermelon. But it doesn't take an expert to work out that the former is loaded with fat and sugar, while the later is packed with vitamins A and C.
And no-carb foods like meat and cheese have a zero GI, regardless of how fat or salt-laden these might be. To be part of a healthy diet, it's best to choose leaner cuts of meat and lower fat dairy foods, says Mrs Stracey. For those keen to keep their diet as natural as possible, GI has another drawback. Many GI gurus advocate the use of artificial sweeteners to satisfy that sweet tooth that is the downfall of so many dieters. But as far as fashionable diets go, this is seen as one of the better ones by health professionals. It reflects the old healthy eating "food pyramid" familiar from school days past. Studies from the Harvard School of Public Health show that the risk of type 2 diabetes and heart disease are strongly linked to the GI of the overall diet. Last month, researchers at Hammersmith Hospitals NHS Trust found that eating just one extra low GI item per meal cut blood sugar levels. "Were we pleased to see the back of the Atkins diet? Very much so," says Mrs Stracey. "We don't really see GI as a fad diet; dieticians have been talking about it since the late 1980s. But no healthy eating plan is easy. People like to do something extreme for a short period of time to lose weight; and the problem with diets is human temptation." One Amazon reviewer disappointed by her bestselling GI tome said there was nothing new she hadn't already been told at Weight Watchers. "If you stick to lean meat, lots of fruit and veg, no sugar and a limited amount of high-fibre carbs, then you'll already be on this diet (and pretty much every other diet that's been around for the past 20 years)." Got a camera phone? 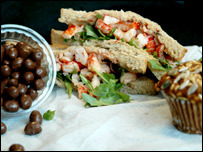 Send us a picture of your lunch, and tell us how healthy you think it is. "It's not healthy but it IS Friday lunchtime," says Donald Shelley, in Grimsby, of his fish and chips, washed down with a refreshing pint of ale. "Here is my lunch," says Lucy Larwood in London. 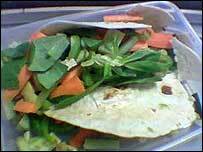 "A homemade salad wrap with carrot, avocado, cucumber, green pepper and lamb's lettuce. As you can see, it has fallen apart but still tastes good. I think it's quite healthy but not sure about the wrap." Kevin from Yorkshire says he's tucked into a large portion of beef & horseradish sauce on white, plus a portion of Melton, crisps with shortbread biscuits for afters. "I start with the dunkers and use the marmite crisps to scoop the cheese spread," says Alan Addison in Newcastle. 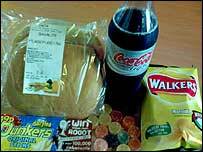 "Main course is the savaloy and Pease pudding bun. Afters are fruit pastles." "My lunch in my office is my fresh mixed granola, with some fruits (apple, banana) and milk from the cows from my neighbour," says Thomas Buckemeyer. "Yes, I think it's not the perfect lunch, but there is no cafeteria here, so I have a substantial meal and it's healthy, I think." Liam Sato used his mobile to snap this photo of a typical student lunch from the refectory at Tokyo University. "Tofu, salad, rice and barley, fried pork and green tea. healthy, filling and only 400 yen - that's about two quid!" 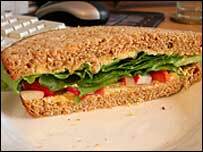 Mark Greaves sent us this picture of his sandwich: "I work at home so this was made fresh by me about 20 minutes ago. Hummus, pimento stuffed green olives, red pepper, radish and curly lettuce on multi-grain bread. Very tasty! I'd say it's fairly healthy - plenty of veggies, wholegrain bread, low-fat hummus. Nothing else with it but I did have a banana mid-morning and will probably have an apple at 3pm." The best way to send pictures is to e-mail them to us. Send them to the.magazine@bbc.co.uk. Don't forget to include your name and some background information about the picture. Please use the word LUNCH in the subject line of your e-mail. If you want to send your picture from your mobile phone, dial 07921 648159. You can send them from any network or phone. Please send the large full size images (usually 640x480 pixels) taken by the mobiles otherwise they are too small to publish. It's important to note, however, that you still own the copyright to everything you contribute to BBC News. This means you are perfectly free to take what you have produced and re-publish it somewhere else. Please note that if your image is accepted, we will publish your name alongside it on the BBC News website. The BBC cannot guarantee that all pictures will be published and we reserve the right to edit your comments.